Yes, the Sistine Chapel and the Sacré Coeur are impressive pieces of architecture, but, like most Catholic churches, their exterior tend to be sober and austere, lacking the color and the tiny bit of fun that could make walking in a little more tempting. 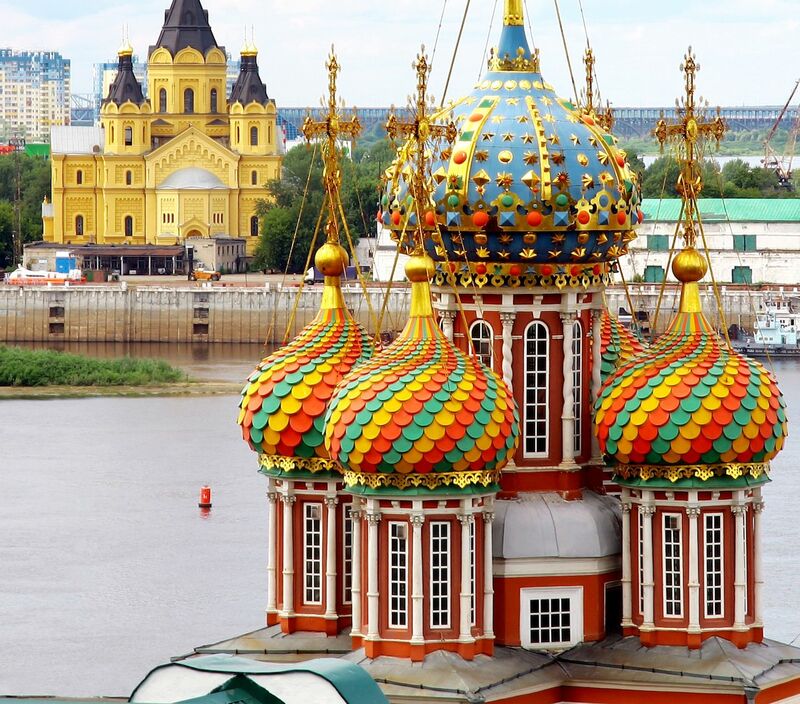 Eastern Orthodox churches don’t have that problem — they tend to be brightly painted, and the “onion domes” that top them make them look straight out of Candy Landy. 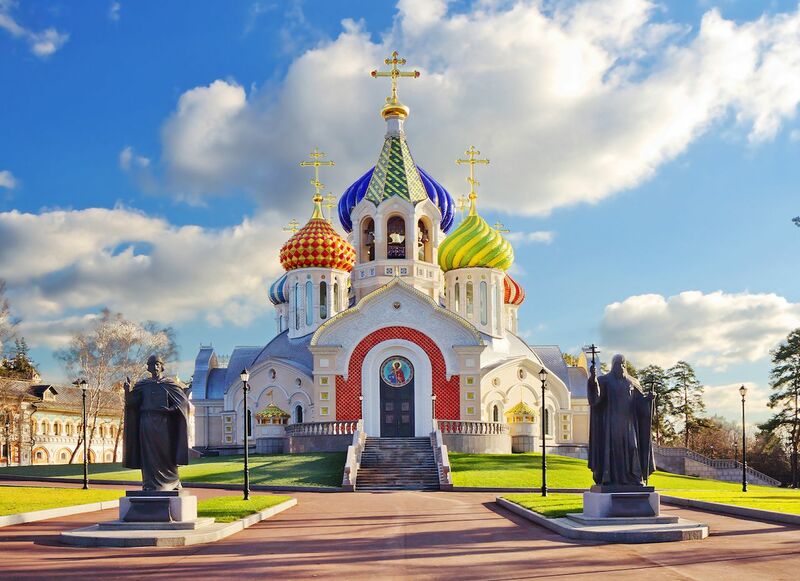 The most iconic Russian Orthodox church is St. Basil’s Cathedral in Moscow, but it’s far from the only merry-looking church worth visiting in Russia. Here are seven of the coolest-looking Russian churches you should definitely seek out. The Church of the Nativity of St. John the Baptist is not visitors’ first choice when in St. Petersburg (that should undubitatively be the Church of the Savior on Spilled Blood, where Tsar Alexander II was assassinated), but it’s definitely the most beautiful one in town. 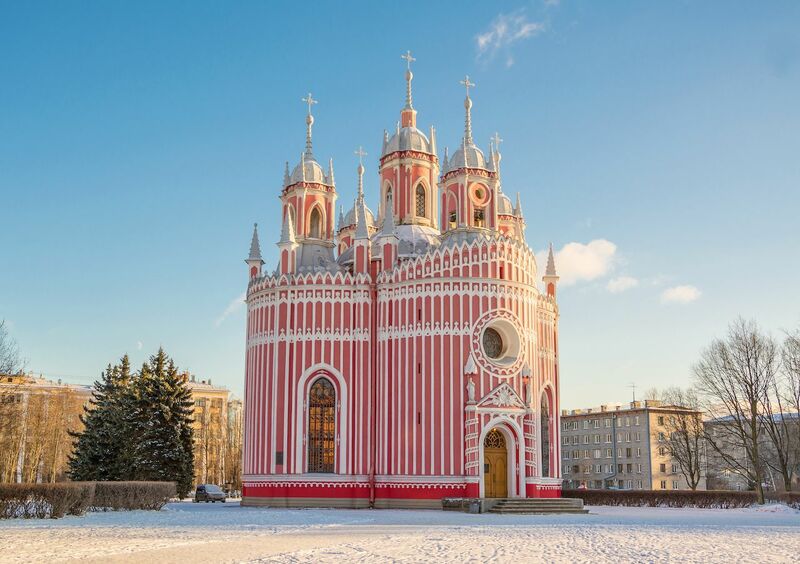 Built in 1780 and restored in 1946 after being damaged during the 872-day siege of the city by the Finns and the Germans during WWII, the Church of the Nativity of St. John the Baptist, also called Chesme Church, is painted in pink and white vertical stripes, giving it a candy cane look. The vertical stripes and the pointed spires on its towers give the small church the illusion of soaring heights. This church does not have the colorful appeal of other Eastern Orthodox churches; in fact, its wood construction and lack of color give it a bit of a creepy look. That said, the Church of the Transfiguration, located on Kizhi Island is still a stunner. The many roofs and bulbs (twenty-two of them), as well as the shapes and the height of this church ( it is 37-meter high), make it instantly appealing. 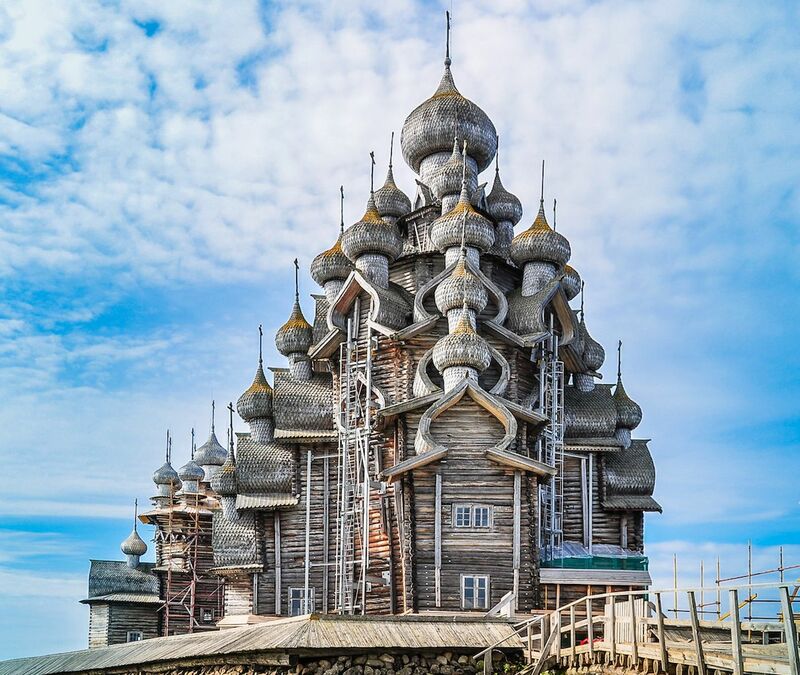 There are two 18th-century wooden churches on Kizhi island (the Church of the Transfiguration and the Church of the Intercession), as well as an octagonal (also wooden) bell tower, and all three are UNESCO World Heritage sites. The churches of Kizhi Island were originally built in the 16th century but were destroyed by lightning and rebuilt in the 18th century. Once again, the Church of the Holy Igor of Chernigov is not at the top of the list of those visiting Moscow — the church that tourists flock to is the gorgeous St. Basil’s Cathedral — but it is definitely worth checking out. 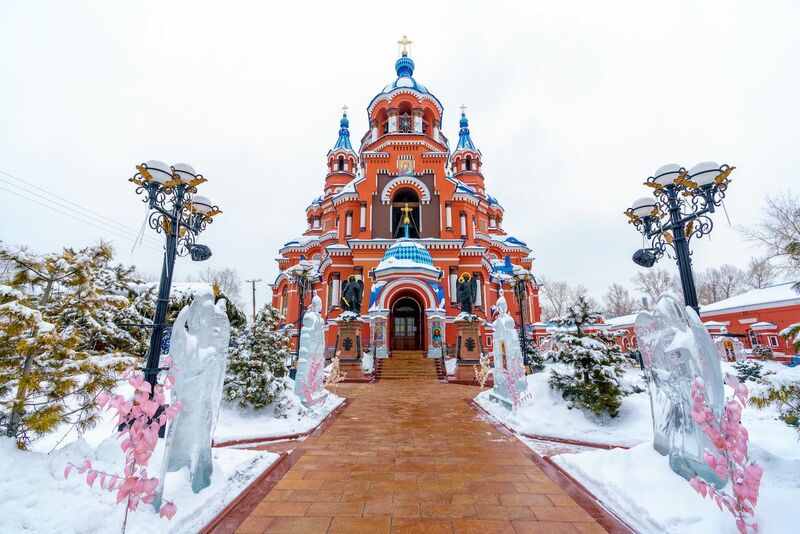 You’ll have to go look for the Church of the Holy Igor of Chernigov because you won’t stumble upon it while strolling around the Red Square — Peredelkino is a district of Moscow about twenty-five kilometers away from the city center. The Church of the Holy Igor of Chernigov is a very recent construction (it was completed in 2012), but it does not take away from its beautiful architecture. This large church (it can accommodate twelve hundred people) is topped with ten onion domes, themselves topped with golden crosses. Each dome is different and they are all incredibly colorful. Inside, the walls are curved to give the impressions that visitors are inside a huge version of one of these domes. 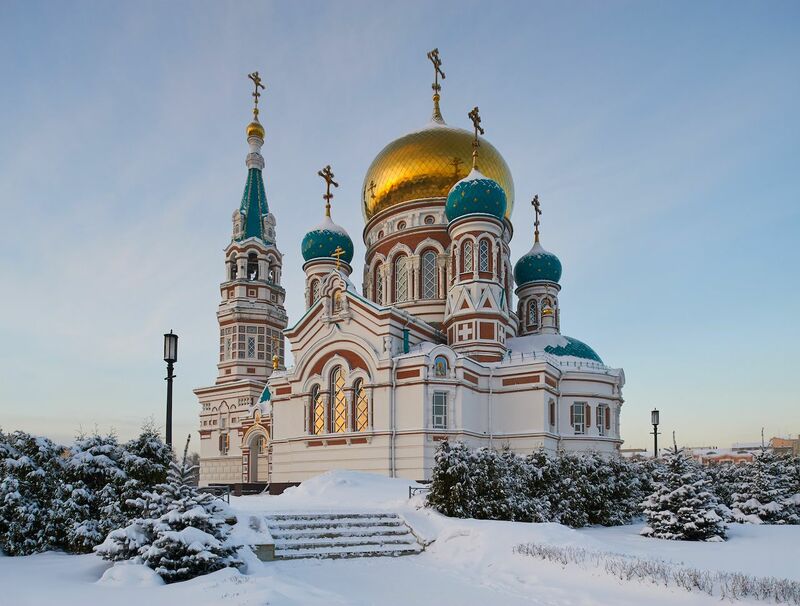 Despite its remote location, the city of Irkutsk, located on the shore of Lake Baikal in Siberia, hosts one of the most beautiful Russian Orthodox churches there is. The Church of Our Lady of Kazan, also called “Red Church” by the locals opened on Easter 1892 after seven years of construction. This church was built in the Neo-Byzantine style and was renovated from 1990 to 2012. 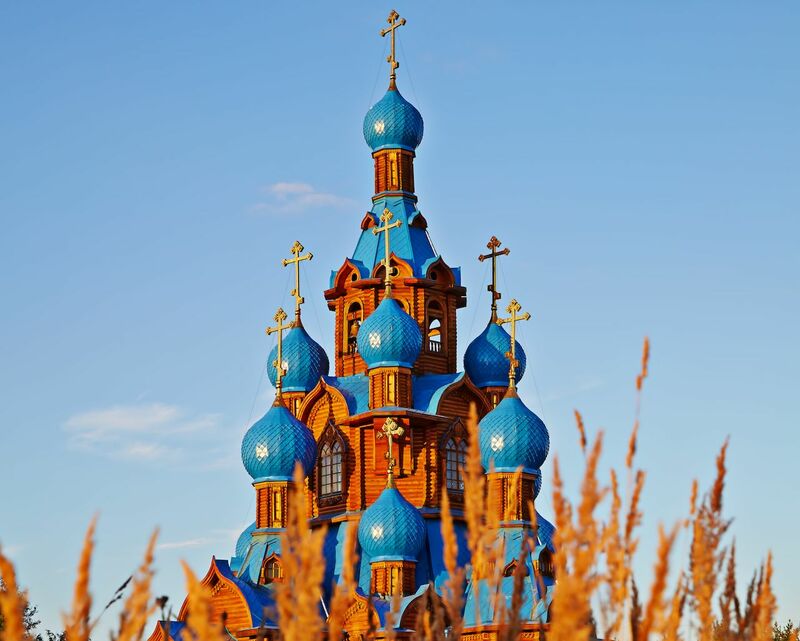 Those who plan on traveling on the Trans-Siberian train all the way to Irkutsk or beyond should take the time to check out this uniquely colorful church. The Stroganov Church, also called the Church of the Nativity of the Most Holy Mother of God, was started in the late 17th century, but because several fires, it was only completed in the late 18th century thanks to funds donated by the Stroganov family, patrons of Russian art. The church is bright red and topped with five ornate domes. Reminiscent of the domes of St. Basil’s Cathedral in Moscow, they are very colorful and mosaic-like. Even though the domes are the most eye-catching elements of the Stroganov Church, its walls and windows are also highly decorated in a Strogonov baroque style. The Cathedral of the Assumption in Omsk (a city close to the border between Russia and Kazakhstan) was completed in 1898 after seven years of construction. It got destroyed by the Bolsheviks during the Soviet era, but was entirely rebuilt after the collapse of the USSR and reopened in 2007. According to Lonely Planet, there used to be a statue of Lenin close by, but it was removed in the early 2000s because religious officials did not want a representation of a communist and an atheist anywhere near this gorgeous church. The Cathedral of the Assumption, also called the Dormition Cathedral, is a white and red building topped with five domes; four of them turquoise and the large, central one, gold. About ten years ago, a new Russian Orthodox church, the Transfiguration Church, was built in Star City. The church is made of wood and is topped with dark-blue domes, creating a beautiful contrast. Despite its apparent simplicity, this church has gorgeous ornate details around its windows. Star City (Zvyozdny gorodok) is an area close to Moscow where the USSR’s first cosmonaut training center was located. At the time, and until the mid-1990s, the location was kept very secret to keep information regarding space exploration from leaking out of the Soviet Union. Today, the training facility is called The Gagarin Cosmonaut Training Center and is not a secret any longer, but it is still the place of residence and training of many cosmonauts.